Description: A closeup of a black sign on a wooden door reading, in Roman orthographics, “Caution. This door opens outwards. Please do not stand directly in front of the doors.” Beneath that is Braille text, presumably for the same message. Two years ago I wrote a set of posts called “A User’s Guide to PTSD.” They attracted a lot of attention, and several people friended this LJ in the hope that I would write more in the same vein. I pointed out that I write about mental illness approximately once every two years, so it could be a long wait. If any of them are still reading, I hope they enjoy this follow-up. If you missed the first set, I’ve linked them below. The example they’ve set with their lives has influenced how some experts think about a decision many take for granted: that conjoined twins should be separated if possible. As some families with a Down syndrome child have noted, fewer kids with Down may mean fewer public programs, fewer resources in schools and for housing and less political clout. If some genetic diseases begin to fade away, will society’s willingness to provide support for the diminishing numbers of those born with such diseases fade as well? And are we headed to a time when parents who choose not to be genetically tested find themselves condemned as morally irresponsible parents? Proposed cuts to Virginia’s Medicaid program could make that waiting list even longer, Wooten said. The waivers fund a variety of services that help people with disabilities continue to live in the community, such as supported employment, companion services and nursing care, Wooten said. With the support they receive through the school system, the Mays said they are able to care for their son without state aid. Sam May attends the Davis Career Center at Marshall High School, where he learns life and career skills and is able to work in a company’s mailroom. If her son cannot get state-funded services when he graduates, Kathy May said she is not sure what the family will do. She and her husband work full time, so one of them likely would have to quit to care for him. Without two incomes, they probably would have to sell their home and move, she said. I really liked the one from Oddly Specific when I saw it. Finally, a funny joke about braille that doesn’t involve ATMs. I think the ABC story is interesting, especially with the Evelyn Evelyn news. There is actually an “accessible toilet” like this in a cafe here in Kingston. Not in terms of the Braille sign, but there is a low entrance and there are signs saying “mind your head”, but of course a blind person won’t know until head meets wall. It’s accessible enough if you’re in a wheelchair, though. In light of the Evelyn Evelyn controversy, the article about the Schappells, who have a sense of themselves as happy, well-adjusted, productive, satisfied human beings gives a pointed alternative to the Evelyn Evelyn project’s idea of conjoined twins as unusual, deformed, pitiable, sensational, etc. I was noodling around reading about the Schappells and found this: http://nymag.com/nymetro/health/features/12470/ it’s sort of interesting, I haven’t finished reading it but it’s basically about whether conjoined twins should be separated, with a doctor who does it seeming pretty confused by the idea that anyone could be okay with being a conjoined twin, and the Schappells being interviewed to show the other side (“the other side” being, of course, people who actually have the experience). That page about the Braille sign is really annoying. Why are people so set on proving that accessibility is useless, hilarious, and bad? That sign makes sense. Blind people will feel the words and step away from the door. Do the people on that website just want blind people to not know what it says, and stand in front of the door until they get hit? I thought they wanted to point out the fail of the people who placed the braille sign that says not to stand close to the door right in front of the door (instead of somewhere more safe and logical), not trying to imply that braille signs are useless…. was I just being overly optimistic? Norah: That’s exactly how I read (and intended, here) the inclusion of the sign. It’s crip humour that’s actually funny and not mean-spirited. The comments at Failblog (and that entire stable of blogs) are a completely different story, and are always worth avoiding. Norah, that was how I read it, too. Also, do blind people go around touching the faces of doors, expecting them to be embossed with braille? 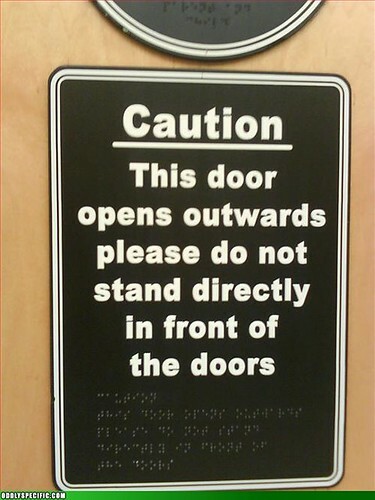 I’ve only ever seen braille by the opening seam of a door, or near the handle (like, where one’s hand would go). But I admittedly don’t know much about that subject.